I read with both amusement and dismay your edition of April 10. My dismay arose from 32 arrests at peaceful rallies sponsored by the Coalition Against Apartheid. Why anyone would be arrested at a peaceful demonstration is beyond me, because the university's role is to foster an open mind and tolerance. Although I was persuaded by President Paul E. Gray '54's rebuttal on the issue, I believe that a little perestroika is needed in Cambridge. Apparently, the editors of The Tech share this position ["MIT wrong to crack down," April 10]. I was a staff reporter and news editor of The Tech between 1968 and 1973, a turbulent time which seems to have achieved near-mythical proportions. 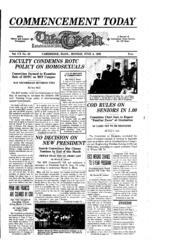 Then, although there was a war on and tensions were running unusually high, the administration somehow managed to show a reasonable degree of tolerance and did not resort to arrests during nonviolent demonstrations, even when the offices of the president and the chairman were occupied for many days. Why arrests of peaceful demonstrators are necessary now is beyond me. My amusement arose from another editorial published that same date ["MIT should eject ROTC from campus"]. On the one hand, The Tech called for greater tolerance of demonstrators protesting apartheid and other fashionable causes. On the other hand, it editorialized in favor of immediately evicting ROTC from campus. Free expression of ideas by all parties, whether popular or not, is the essence of any university worthy of the name. ROTC has as much right to be on campus and express its views as do the anti-apartheid demonstrators. ROTC deserves similar tolerance from you and other dissenting students. My former roommate during the early 1970s was enrolled in Naval ROTC and commissioned upon graduation. He was a tolerant, liberal, and educated person who chose to become a career naval officer rather than attend medical school. He hasn't changed despite 18 years in the Navy; he is far from being a "fascist" and still opens his mind to the opinions of others. I trust that The Tech likewise will support free and open exchange rather than suppressing a particular point of view.